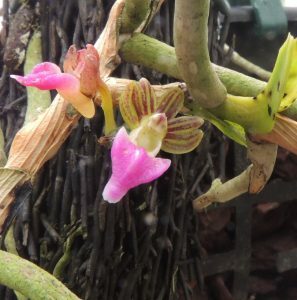 This species has grows as a climbing stem with alternate 4cm leaves and these interesting flowers produced from the stem. Pelatantheria insectifera is native to lowland forest in the Himalayas and South East Asia and we find it enjoys warm temperatures and drying out between waterings. The thick fleshy water storing roots indicate a dryish native habitat and the growth habit suits growing the plant mounted.